Dogs frequently engage in performance-based competitive and recreational activities, ranging from flyball to sled pulling to agility, and nutrition is increasingly used to maximize an animal’s potential and stamina. Each canine activity has unique requirements for performance, which influence the caloric requirements and metabolism of individual animals. Modification of feeding can, therefore, affect a dog’s adaptation to such events. An expanding body of evidence suggests best practices for dietary modification in these dogs, and practitioners should be prepared to discuss the growing field of performance nutrition with interested owners. DOES EVERY CANINE “ATHLETE” NEED MORE CALORIES? Additional activity requires more calorie expenditure. Veterinarians have frequently multiplied the resting energy requirement by a factor to account for the activity level of a dog.2 However, the increases in energy expenditure by working dogs are directly related to the distance traveled during that work. Type IIb fibers, which rely more on anaerobic glycolysis and, therefore, experience fatigue faster; however, these fibers permit explosive, but poorly sustained, bursts of activity. Duration of muscle activity determines the primary fuel source used for contraction. Adenosine triphosphate (ATP), in small amounts, is used rapidly at the onset of activity but is quickly depleted. Adenosine diphosphate, with help from creatine phosphate, can be converted to ATP, but sustains activity only temporarily. Glucose is subsequently used for aerobic or anaerobic metabolism, and glycogen provides reserves for moderate exercise. Short bursts of explosive activity, known as supramaximal exercise, can be sustained only as long as glycogen provides glucose for anaerobic metabolism. Dietary fat is more energy dense than protein and carbohydrate: protein and carbohydrate contain between 3.5 and 4 calories per gram, while fat contains 8.5 to 9 calories per gram. The range arises from the digestibility of the ingredients. This difference in energy density between fuels means that working dogs can be fed additional calories by increasing fat in the diet rather than the amount of food given. This must be done cautiously to avoid inadvertently creating relative nutrient deficiencies. Many canine sports require a consistent amount of exercise from participants. Short bursts of explosive activity—common in sports, such as flyball or agility—require only small increases in calories. Conversely, endurance sports, such as field trials, hunting, and cart pulling, require more energy given the greater distance dogs must traverse. In addition to distance and exercise duration, other factors, such as thermal stress, terrain or slope, and ambient temperature, should be considered. The guaranteed analysis found on dog food packaging is the primary reference for owners, but is of little utility for comparing pet foods. Instead, nutrients are best expressed on a caloric basis, commonly related as the mass (g) of a given nutrient per 1000 Calories (kcal). This value can be estimated from the guaranteed analysis by using a calculation method described in Beyond the Guaranteed Analysis: Comparing Pet Foods, available at tvpjournal.com in the Resources section (see In-Clinic Materials). Dietary modification for active dogs should be based on the distance of activity, irrespective of the perceived intensity (Figure), and dietary recommendations can be based on the type of activities in which a dog participates. Most research published is based on racing greyhounds.1 The normal body condition score for such sighthounds is 3 to 4 using a 9-point scale as opposed to 4 to 5 in other breeds. Carbohydrate is used as a primary fuel, and modest increases in dietary carbohydrate may confer a small benefit. The recommended carbohydrate amount is 105 to 135 g/1000 kcal.8,9 Commercial diets range from minimal amounts (< 5 g/1000 kcal) in some canned diets to 150 g/1000 kcal in low-protein, low-fat, high-carbohydrate dry diets, with an average of around 100 g/1000 kcal in dry foods. Carbohydrates used in pet foods are often complex, and simple sugars are only infrequently used in performance dogs for post-exercise glycogen repletion when several runs or trials of intense activity are expected. Fat oxidation also occurs; therefore, dietary fat should be moderate (> 30 g/1000 kcal). 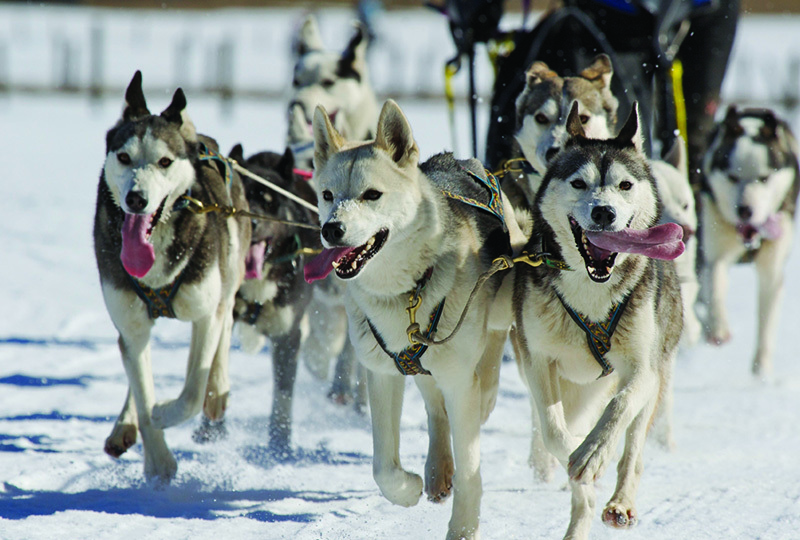 Sled dogs were primary subjects of endurance exercise research. Dietary protein requirements increase with long-distance exercise,1 and select amino acids support gluconeogenesis. Diets containing a minimum of 90 g protein, 60 g fat, and 25 g carbohydrate per 1000 kcal are recommended based on current research.1 Most diets in this category are also low in insoluble fiber (or crude fiber), which allows the diet to have a greater energy density to meet the increased calorie requirements for long-distance activity. Soluble fibers, such as gums and oligosaccharides, may still be beneficial in small amounts to provide a substrate for normal intestinal bacteria. Performance Enhancers or Clever Marketing? Dietary supplements are reviewed extensively in Surveying Supplements: Current Trends, Research, & Recommendations (May/June 2014), available at tvpjournal.com. Owners of performance dogs more frequently administer several specific supplements; the usefulness of these supplements is outlined in Table 2. * Some vitamin requirements are affected by the macronutrient composition of the diet; however, increased food intake and liberal safety factors in commercial diets minimize the need for additional intake. Owners of working dogs understand that hydration is critical to safe and maximal performance. Veterinarians working with athletic dogs may encounter inquiries about the best ways to rehydrate animals after exercise. Sedentary dogs require 0.6 to 1 mL of water per calorie Q 24 H.1 This approximates 50 to 100 mL/kg/day, with smaller dogs requiring more water per kg of body weight. Dogs continue to consume water even if dietary moisture is very high, and water intake rises with increases in plasma sodium and urea. Temperature, duration of exercise, and efficiency of panting (dependent on airway structure and humidity) are the primary determinants of water needs. Exercising dogs develop natriuresis, which prevents an increase in plasma osmolality despite dehydration.1 Post-exercise potassium changes are rarely significant enough to warrant supplementation beyond the amount found in commercial diets. Free water consumption after exercise rapidly corrects dehydration, and the kidneys adjust sodium balance. Maintenance pet foods provide adequate electrolytes for exercise; additive dietary sodium is required during initial training only if an animal is fed a low-sodium diet. Additional supplementation with electrolytes, fluids, or sports drinks has never been associated with any scientifically proven benefit. Owners may acquire and train young growing dogs with the intent of competing in canine sports. 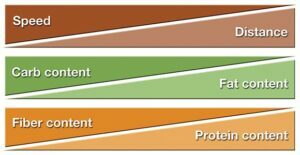 Nutritional requirements are generally much narrower during growth; therefore, consideration of appropriate feeding is critical. Precisely control calcium and vitamin D concentrations. An allowance of 3 g of calcium/1000 kcal, and a minimum of 2 g/1000 kcal, has been recommended for puppies.1 An average commercial dog food containing 3500 kcal/kg of diet would likely have a guaranteed analysis of 0.7 to 1.1% calcium. However, this guaranteed value on the label represents a minimum amount in the diet and should be interpreted with caution. A safe upper limit of 4.5 g of calcium/1000 kcal has been suggested for giant breed puppies.1 Large breed formulas generally conform to these guidelines, but feeding adult foods may produce deficiencies in essential nutrients. Puppies should maintain a normal body condition, objectively assessed by using body scoring charts. The total energy intake of a dog at 4 months of age is often similar to the energy intake of a young adult (1—2 years old); this can be used as a guide to provide feeding recommendations. Caloric intake recommendations found on product labels are inconsistent and unreliable in many cases. Critically evaluate home prepared, raw diets, and other alternative feeding strategies during growth, when the effects of dietary deficiency or excess are most profound. Special Foods for Senior Athletes? Some senior diets may have reduced protein and phosphorus based on an unproven theory that such reductions decrease the risk of renal disease, while other senior diets may be reduced in fat to prevent weight gain and obesity. Active senior pets in normal body condition benefit from diets with elevated protein and fat to preserve muscle mass and calorie intake, respectively. Diets containing greater than 75 g of protein and 35 g of fat/1000 kcal are recommended for healthy, active senior dogs.20 Guaranteed analysis values for these diets are often greater than 26% minimum protein and 13% minimum fat in dry foods. Both retired and competing geriatric athletes may benefit from rehabilitation and the related nutritional interventions, which will be discussed in Part 2 of this article series. Nutrition is a cornerstone of any veterinary assessment, and the evaluation of performance should include dietary analysis. The aforementioned distance-dependent energy requirements and nutrient considerations provide simple principles for optimizing an animal’s potential, as outlined in Table 3. National Research Council Ad Hoc Committee on Dog and Cat Nutrition. Nutrient Requirements of Dogs and Cats. Washington, DC: National Academies Press, 2006. Hand M, Zicker SC, Novotny BJ. Feeding working and sprinting dogs. In Hand M, Zicker SC, Novotny BJ (eds): Small Animal Clinical Nutrition Quick Consult. Topeka, KS: Mark Morris Institute, 2011, pp 19-28. Hill RC, Scott KC, Williams JM, et al. Energy required for trotting is inversely proportional to leg length in small dogs. AAVN Symp Proc, 2013, p 15. Shmalberg J. Canine rehabilitative and performance nutrition. NAVC Conf Proc, 2014, pp 2648-2655. Armstrong R, Saubert C, Seeherman H, et al. Distribution of fiber types in locomotory muscles of dogs. Am J Anat 1982; 163:87-98. Goto M, Kawai M, Nakata M, et al. Distribution of muscle fibers in skeletal muscles of the cheetah (Acinonyx jubatus). Mammal Biol 2013; 78:127-133. Staaden R. The Exercise Physiology of the Racing Greyhound. School of Veterinary Studies. Perth, Australia: Murdoch University, 1984. Hill RC, Bloomberg MS, Legrand-Defretin V, et al. Maintenance energy requirements and the effect of diet on performance in racing Greyhounds. Am J Vet Res 2000; 61:1566-1573. Hill RC, Lewis DD, Scott KC, et al. The effect of increased protein and decreased carbohydrate in the diet on performance and body composition in racing Greyhounds. Am J Vet Res 2001; 62:440-447. Downey RL, Kronfeld DS, Banta CA. Diet of beagles affects stamina. JAAHA 1980; 16:273-277. Reynolds A, Carey D, Reinhart G, et al. Effect of post-exercise carbohydrate supplementation on muscle glycogen repletion in trained sled dogs. Am J Vet Res 1997; 58:1252-1256. O’Conner WJ. Drinking by dogs during and after running. J Physiol 1972; 226:247-259. Marshall RJ, Scott KC, Hill RC, et al. Supplemental vitamin C appears to slow racing greyhounds. J Nutr 2002; 132:1616S-1621S. Hill RC, Armstrong D, Browne RW, et al. Chronic administration of high doses of vitamin E appears to slow racing greyhounds. FASEB J 2001; 15:A990. Tryfonidou MA, van den Broek J, van den Brom WE, et al. Intestinal calcium absorption in growing dogs is influenced by calcium intake and age but not by growth rate. J Nutr 2002; 132:3363-3368. Taylor MB, Geiger DA, Saker KE, et al. Diffuse osteopenia and myelopathy in a puppy fed a diet composed of an organic premix and raw ground beef. JAVMA 2009; 234:1041-1048. Kealy RD, Olsson SE, Monti KL, et al. Effects of limited food consumption on the incidence of hip dysplasia in growing dogs. JAVMA 1992; 201:857-863. Lavelle R. The effect of overfeeding of a balanced complete commercial diet to a young group of Great Danes. In Burger I, Rivers J (eds): Nutrition of the Dog and Cat. Cambridge: Cambridge University Press, 1989, pp 303-315. Freeman LM. Cachexia and sarcopenia: Emerging syndromes of importance in dogs and cats. J Vet Intern Med 2012; 26:3-17. Shmalberg J, Wakshlag JJ. Nutrition for working and service dogs. Vet Clin North Am Small Anim Pract 2014; 44(4):719-740. Justin Shmalberg, DVM, Diplomate ACVN, is a clinical assistant professor of integrative medicine at University of Florida College of Veterinary Medicine. He received his DVM from University of Wisconsin—Madison and completed an internship in veterinary acupuncture at University of Florida, along with a residency in small animal clinical nutrition.